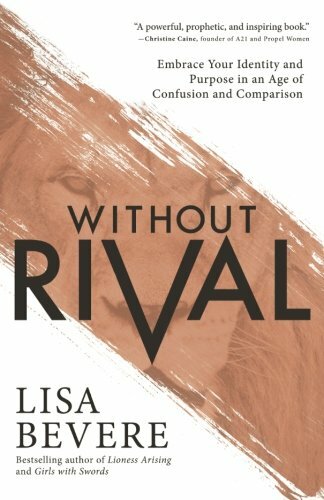 Without Rival is an excellent book that challenged my mind to reconsider my current way of thinking about myself, my relationship with God, and my relationships with others. The author, Lisa Bevere, does an excellent job providing detailed information, examples, and scripture throughout the whole book that thoroughly provides the reader with the feeling and understanding that we, as individuals, are in fact - without rival. She begins by discussing rivalry and explaining that a rival goes beyond just another physical human being. She then breaks down how each aspect of a rival affects our lives and how to overcome them so that we will live a full life without rival. So what does rival mean? Google dictionary says that a rival is a person or thing competing with another either for the same objective or for superiority in the field of activity. However, Lisa explains that a rival is a consistent detractor whose goal is to remove you from the playing field, not so much to actually beat you at the game. She goes on to say that the root of division that plants itself in our lives starts on a smaller, more intimate scale and usually at home where you are surrounded by other wounded people with divided hearts. These divisive tactics send messages and messengers that try to convince us that we’re not enough. It convinces us that we're not good enough, smart enough, pretty enough, rich enough, etc. Because our instinct wants us to deflect these negative messages that bully our minds and hearts, it ultimately yields to them by conforming to the message received by mimicking it or by being critical and accusatory back to the person. We judge when we feel judged. We shame when we feel shame. Isn’t that powerful? That sentence really struck a chord in me. We naturally spend time coveting what other people have because we’ve created an idea of what we think our lives should look like, but we need to fight off the thief called comparison. Our lives have a purpose that only God knows, and His plans for us unfold with or without our direct involvement in the day to day decisions. Lisa makes a great point when she explains why and how God loves us all uniquely, not equally. When we stop to recognize that God loves us all without measure and that He recognizes that we’re all unique creations that require a unique love from Him, we can begin to live our lives without rival of anyone else or from anyone else. Once we recognize that God’s love for us is unique and so are His plans for us, we can begin to understand that God created each with an individual purpose that we need to embrace because of who we are in Him. Lisa explains that we’re not defined by our job titles or relationship statuses, but rather by the designation He gives us. So who are you? Who am I? These designations would be adjectives most likely, but nonetheless they declare WHO YOU ARE inside. Ex: I am brave. I am a mother or I will be a mother. I am kind. I am a child of God. I am an over-comer. The Holy Spirit helps to animate what God’s word outlines about us and our lives. He will prompt our actions to obey, lead and guide us, and warn us when we’re going astray. But, we have to listen for it. Has this happened to you? I know it has for me. We may want to follow the Holy Spirit’s promptings, but sometimes still willingly go astray because it gives us the output that we desire when that output is not necessarily what God desires for us. I’ve commonly heard a joke in podcasts and at my church referring to the song lyric “I surrender all” turned into something along the lines of “I surrender some, only when it’s beneficial for me.” Pretty funny, but accurate! In summary, I do recommend the book Without Rival. I will admit that is was not an easy read in the sense that there is a lot of thought provoking information to take in and the chapters are longer than some books which in turn made me read it slower than normal. I did that to intentionally absorbed the information versus mindless reading that can happen when your eyes read over something but you have no idea what you just read because your thoughts were elsewhere. We're all guilty of that at times! All this being said, I will say that I believe that you (females) will gain a great sense of who you are in God's eyes, how to embrace who you're called to be, and how to acknowledge and limit comparisons to others so that you can truly advance forward without rival of anyone else. Happy Wednesday everyone! I hope you enjoyed this book review and find time to read it too. I'm happy to answer any questions about this book or the others I have listed on my page that I have read. Feel free to email me or comment below. You can find my previous book reviews here that I am slowly adding to my site.